Rooted in the solid foundations of trust. Shaped by the power of imagination. Built by the belief in innovation and quality. 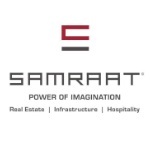 And cemented by the love and patronage of over 2000 patrons, Samraat Group owes its rapid rise to a single-minded resolve of creating pioneering lifestyle concepts that have not only defined the skylines of Nashik city but also redefined the lives of Nashikites. Founded only a decade ago, the Group till date has delivered 30+ landmark projects in the city of Nashik. Each one of them is a testimony to the highest standards in construction quality, choice of the best brands available in the world, usage of new-age technology and the expertise of the best professionals to realize flawless execution.